As Mayor, Brown was viewed by many – including federal investigators – as playing fast and loose with city contracts going to contributors and allies. According to a sworn deposition by the lead official in the process, the company went directly to Brown after failing to qualify. After Brown’s meeting, which was facilitated by Terrance Goggin later to be part of Brown’s team in pitching the Rapid Rail contract bid, Lee directed that the firm was to be allowed to bid. According to a Chronicle story on the case, Lee was hit with a bout of forgetfulness when it came to the details of how that happened. “Corporations and people with close ties to the mayor have received hundreds of millions of dollars in city contracts, development deals, subsidies and grants, records show,” the paper reported. Now out of office for close to a decade. Brown has reinvented himself, according to the Chronicle, which hired him as a star columnist. In an August 2011 Chronicle article that dismissed the likelihood that Brown’s association would harm Ed Lee, the paper helped ease Brown into his new persona by failing to quote a single Brown critic and treating Brown’s way of doing business as an irrelevant past. “Part of the reason is that the FBI probes, patronage and allegations of pay-to-play politics that swirled around Brown’s administration a decade ago have largely faded from memory — or were never known by voters who weren’t here then, analysts said. But if the Chronicle has aided in Willie Brown’s reinvention, by no means does it follow that Willie Brown no longer does business exactly as before. Out of office, Brown now enjoys the luxury of secrecy denied to officials and lobbyists who must disclose contracts, finances and contacts. A hedge on Brown when he was in office was the necessity to meet the expectations of voters. He needed to deliver – or adjust – to meet the varied demands of San Francisco’s political microclimates. When he went too far in one direction the voters would push him back, as they famously did in rejecting his appointees to the Board of Supervisors in the 2000 election. Ed Lee became Willie Brown’s Inside Man almost two decades ago, when Brown turned to him to approve minority contracts for his backers. Lee went on to hold positions where he could tweak the requirements for contractors, order “re-evaluations” where necessary, even reverse his staff and his own earlier findings on behalf of contractors tied to Brown. Some of those instances were reported during the 2011 mayoral campaign or were seized on by Lee’s opponents. They ranged from contracts awarded for computer services later determined to be fraudulent to contracts at the airport to a bidder that twice failed to get top ratings to a “nonprofit” that didn’t actually exist and that federal official ordered its grant returned to the city. By 2011, when Ed Lee became the Interim Mayor, many of the economic engines that powered Willie Brown’s machine had peaked or soon would. One by one, the winners of the leases and options went to Willie Brown’s former clients or partners – Mission Bay to the University of California, Hunters Point to Lennar, Treasure Island to Darius Anderson and Ron Burkle. Each time, the decisions were made by city officials who reported to Willie Brown or were approved by a Board of Supervisors dominated by Brown’s own appointees. The city, like the rest of the nation, hit an economic slump by the end of Gavin Newsom’s term as mayor. The easy route to riches was gone. Mayor Lee asked that the state legislature exempt San Francisco from the requirements of other jurisdictions, where appointments are shared with the local city council or Board of Supervisors, to allow the mayor to make appointments for the city. The result is that the new Oversight Board includes the mayor’s Planning Director, Housing Director, and his Public Finance Director. There are no appointees from the Board of Supervisors. Under the requirements, BART has one seat; Lynette Sweet, an unsuccessful Brown backed candidate for the Board of Supervisors and former treasurer of the nonprofit Third Street Economic Development Corporation found to have failed to meet its financial responsibilities, holds that seat. The main activity of the nonprofit appears to have been to hold annual birthday celebrations for then-mayor Willie L. Brown, Jr. Later she was named to the Redevelopment Commission where she cast the deciding vote for Lennar to control the Hunters Point projects. With those projects secured, the hunt was on for new economic opportunities. What hadn’t changed was the formula that relied on San Francisco’s City Hall to help accomplish their goals. And no one knew City Hall, so it seemed, like Willie Brown. “You’re seeing a generational shift,” said Mark Mosher, a political and policy consultant who once led the Committee on Jobs, which advocated on behalf of the city’s largest companies. “Who is going to lead this new era? The good news is that San Francisco is a place that is always going to attract the best and the brightest,” observed a Chronicle columnist. Faster than a high speed Internet connection, Willie Brown was showing up with a Silicon Valley “angel investor,” Ron Conway. By August, when Lee announced he would change his mind and run for a full term, Conway had launched an independent expenditure campaign that would raise more than $600,000. One of the speakers at a Conway fundraiser was Willie Brown. In turn, Conway became an advisor to Ed Lee, who told reporters that he was listening to Conway on how San Francisco could launch a new boom with tax incentives aimed at high tech industries. Lee urged approval of a special tax district on Market Street, encouraging Twitter to move its headquarters to mid-Market. To do that, the owner of the Market Square sold the building to Shorenstein Properties, a longtime Brown ally. Twitter got the tax break and moved into the building facilitated by Brown. Later the companies estimated their savings at more than $30 million. Lee, in a moment of irrational exuberance, then announced he would seek to replace the short-term tax holiday with a permanent one. The boom was on. Lee’s election night victory party was hosted by Willie Brown, according to the invite, but the man writing the checks was Ron Conway and the tech industry leaders he had brought on board. The evening included a replay of a video ad for Lee “2 Legit 2 Quit” that featured MC Hammer – and Willie Brown. It also was underwritten by Conway. The night before Lee’s Inauguration, Brown held an invite-only dinner for 300 at the Palace’s Garden Court, and once again, there was no disclosure of who paid for the fete. The next day, Lee’s Inaugural Host Committee included Ron Conway, once a man in the shadows and now on the City Hall grand staircase. Two years earlier, Conway, in a reference to Progressives who populated the Board of Supervisors, had famously told a business group “We have to take back our city.” Now he was climbing the steps with the new mayor and the former mayor. Mayor Lee pledged his support. The San Francisco Business Times gave more specifics. “Surging technology companies have become some of the fastest-growing employers and commercial tenants in San Francisco. Now they’re poised to become an organized force at City Hall. “Republican Silicon Valley “angel investor” Ron Conway will announce today that he and roughly 80 high-tech firms – including microblogging service Twitter, cloud-computing company Salesforce.com and social-game designer Zynga – have formed an interest group to engage city officials on public policies that affect them. Lee’s statement was a virtual echo of Conway’s announcement the previous week. “Cities must be laboratories for innovation across the nation to create new jobs, improve government transparency and efficiency and build new public-private partnerships,” read Lee’s statement. Once again, any obstacles such as regulatory rules appear to be giving way to political pressure from the mayor’s office, as the Bay Citizen recently reported. A plan to allow one high tech company to offer its services to allow customers to pay taxi fares ran into objections that the collected fares were not reported in the city’s system, allowing for an unacceptable leeway between actual receipts and recorded ones, according to the Matt Smith article. 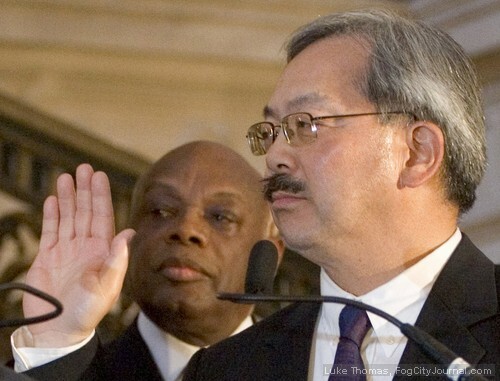 Mayor Lee knew just how to handle this hiccup. “We’ve been in discussion with people in the Municipal Transportation Agency’s taxi division to get off of initial positions that were held out of fear, and embrace what could be a technology that benefits everybody,” Lee told the Bay Citizen. The company is one of those where Ron Conway has put his money. Another is Airbnb which would like to be exempted from paying the city’s hotel tax when rooms are rented through its services. That too now is the subject of City Hall discussion, the Bay Citizen reports. If these serve as reminders of the way City Hall operated under Willie Brown, it’s not likely at this point to present any real problems for Lee. If anything, the prospects may get even rosier. City Assessor Phil Ting is a favorite to win an open seat in the state assembly, and if he wins, so does Ed Lee who then can appoint a new city assessor. That’s the spigot for all property tax assessments notably when properties change hands – and the current boom in commercial property hinges on the tech industry. As San Francisco turns to implementing this tech agenda, Willie Brown’s money machine is ready. The Department of Technology’s spokesperson is Brown’s former press secretary and frequent companion at movie showings. The contracts themselves will go through the Chief Administrative Officer, Naomi Kelly. The Chronicle, home to Brown’s column, can be counted to play its supportive role. It has been converting space at its historic Fifth and Mission Building into a farm for tech start-ups and owners of companies now enlisted in Conway’s group. In a cheery note, the Chronicle weighed in on this bright future. The Willie Brown Money Machine is up and running. Previous post: Lee vs. Nuru: Not Happening!